The tinsel-strewn sequel to The Taffetas! It’s Christmas in Muncie, Indiana, and The Dumont Television Network is featuring the bright-eyed and bubbly 1950s girl group The Taffetas on its weekly show “Hometown Hoedown.” Dishing out a collection of favorites from the original Off-Broadway hit The Taffetas, effervescent new songs, and seasonal classics, A Taffeta Christmas is a twinkling hometown holiday – the way it used to be! 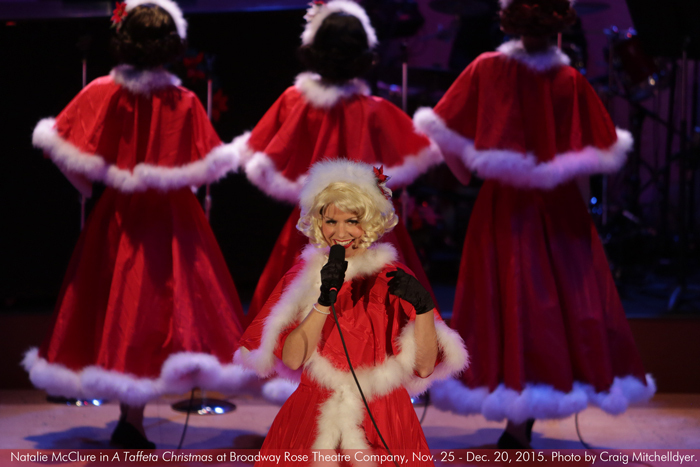 During the run of A Taffeta Christmas, Broadway Rose is partnering with Good Neighbor Center to collect essential items for local families overcoming homelessness. Click here to find out how you can help! KIRA BATCHELLER (Donna) is thrilled to be back on the Broadway Rose stage after portraying Patty Simcox in Grease! She began her career as Marian Paroo in her high school’s production of The Music Man and hasn’t looked back since. 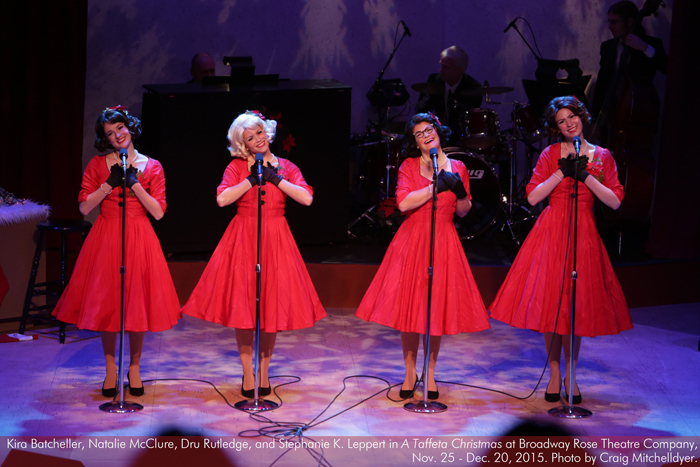 Local credits include It’s a Wonderful Life with Stumptown Stages, Young Frankenstein with Lakewood Theatre Company, Dreamgirls with Portland Center Stage, and The Snowstorm with CoHo/Many Hats Collaboration, which won the 2015 Drammy for Best Production. Other credits include Company (April), The Ladies Man (Yvonne), The Liar (Lucrece), Almost, Maine (Glory/Gayle); and Picnic (Madge). Kira is a graduate from Western Oregon University with a B.F.A. in Acting. This summer she had the exciting opportunity to direct and choreograph her first project: a Peter Pan camp for Spotlight Musical Theatre Academy. STEPHANIE K. LEPPERT (Kaye) holds a Bachelor’s of Fine Arts in Theatre from The American Musical and Dramatic Academy (Los Angeles campus). This is her first Broadway Rose production and she couldn’t be more thrilled! She’s appeared on the Bag&Baggage Productions stage previously in The Best of Everything (Brenda), Lear (Cordelia) and Julius Caesar (Portia). She’s also worked with Lakewood Theatre in South Pacific (Nellie) and White Christmas (Rhoda). Various other credits include Into the Woods (Cinderella), Our Town (Emily), The 25th Annual Putnam County Spelling Bee (Olive), Twelfth Night (Olivia), and Les Misérables (Cosette). Be sure to come see her on stage next spring in James and the Giant Peach (with Oregon Children’s Theatre) as mean Aunt Spiker! In addition to performing, Stephanie is a licensed massage therapist and certified chiropractor’s assistant at Lula Health Center in SE Portland. NATALIE McCLURE (Cheryl) is excited to be making her Portland theatre debut with Broadway Rose! Natalie recently moved to Portland from New York City where she lived for almost a decade. As an ABBA lover, her favorite role was in the Las Vegas production of Mamma Mia! (Sophie U/S). She has performed in many productions across the U.S., and holds a B.F.A. in Musical Theatre Performance from Western Michigan University. Most recently, Natalie has been working as a co-creator/co-producer/co-star in the show, Kid Friendly*. This digital series has been nominated for Best Comedy, Best Series, and won awards at numerous film festivals; the most exciting being a CBS Interactive development prize at iTVFest. Watch it at kidfriendlyshow.com! Proud member of Actor’s Equity. DRU RUTLEDGE (Peggy) appeared most recently at Broadway Rose as Laurey in Oklahoma! and feels so lucky to be back for the Christmas holiday. A proud Kansan by birth, Dru is so happy to call the beautiful Northwest her home. Since graduating with her master’s degree in Opera Performance Dru has performed locally with Portland Opera, Portland Center Stage, Lakewood Theatre (2015 Drammy Award for Best Actress in a Musical for her portrayal of Amalia in She Loves Me), Clackamas Repertory Theatre, Mock’s Crest, BodyVox, The Oregon Symphony, and the Portland Gay Men’s Chorus. Dru also just returned from performing, for the second year in a row, with the New World Symphony in Miami. Visit drurutledge.com for more on Dru. 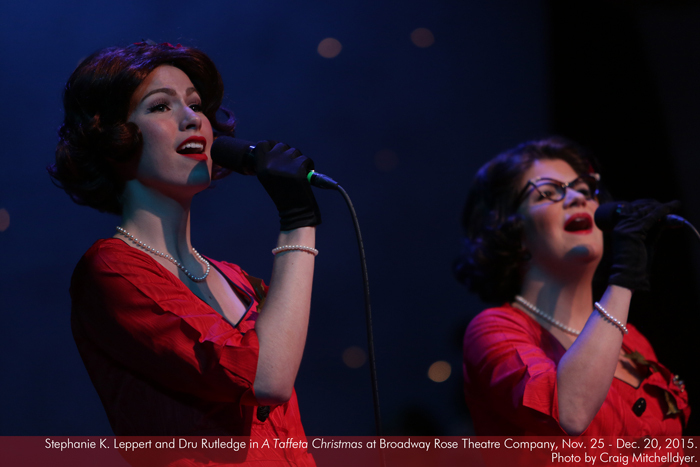 As we’ve come to expect from Broadway Rose, “A Taffeta Christmas” has extraordinary singers and a talented band. For those of you who wholeheartedly reject the Scrooginess of the other offerings, “A Taffeta Christmas” is your cup of cocoa. Read more. 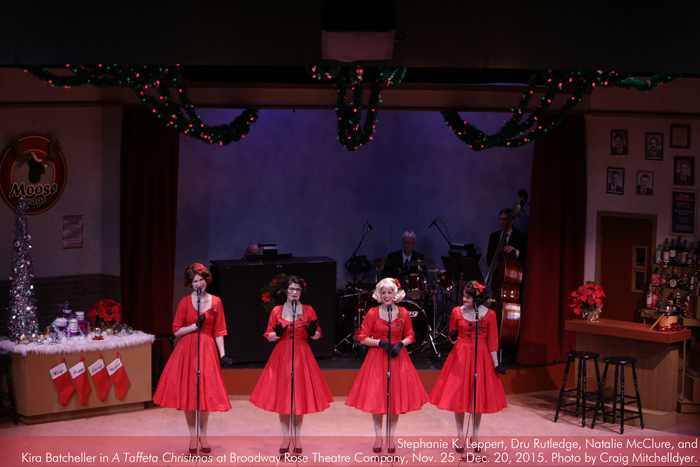 It’s beginning to look a lot like Christmas all over the metro area, but nowhere is the holiday spirit launched with more heart and verve than Broadway Rose’s New Stage in Tigard. Read More. 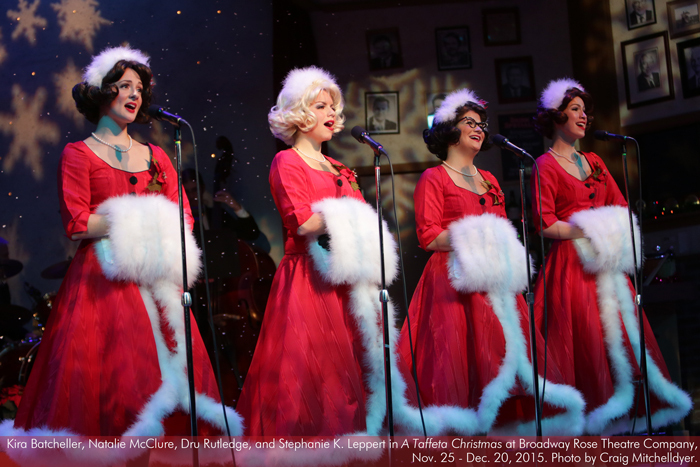 What you should go see it for is the music… if you love Christmas music or grew up listening to the girl groups of the 1950s, this is exactly the show to get you into the holiday spirit. Read More. 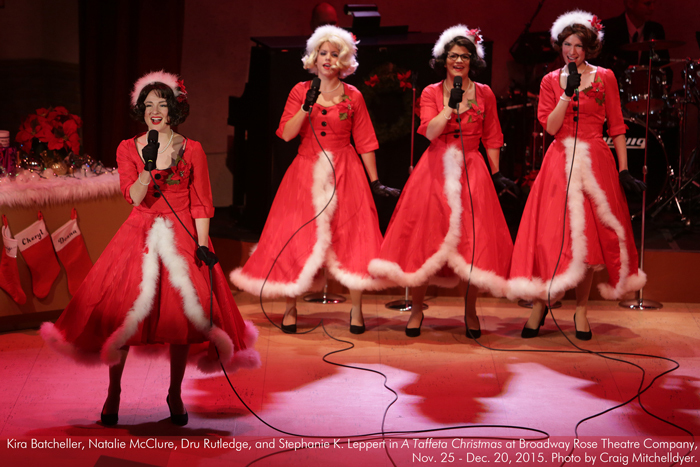 Kaye, Peggy, Cheryl, and Donna take viewers on a nostalgic trip to the 1950s as they share their favorite Christmas songs and holiday memories… “And the fact that the four girls will make you giggle or laugh with their naive banter and sincerity is what the show is about – and the music.” Read more. 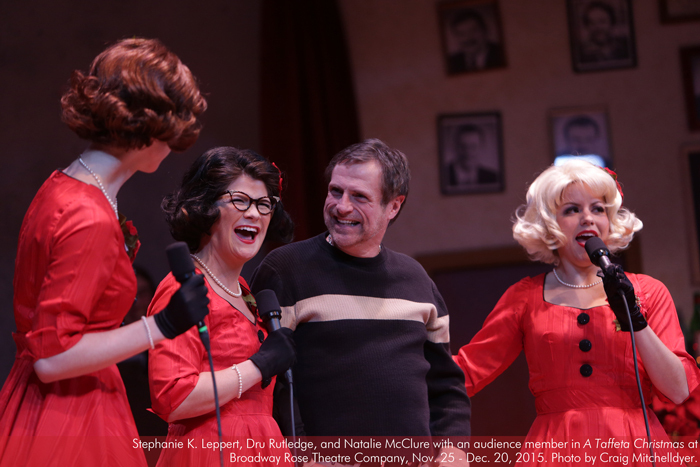 I hope you like holiday shows, because our local theater scene is about to be chock full of them… Read more. 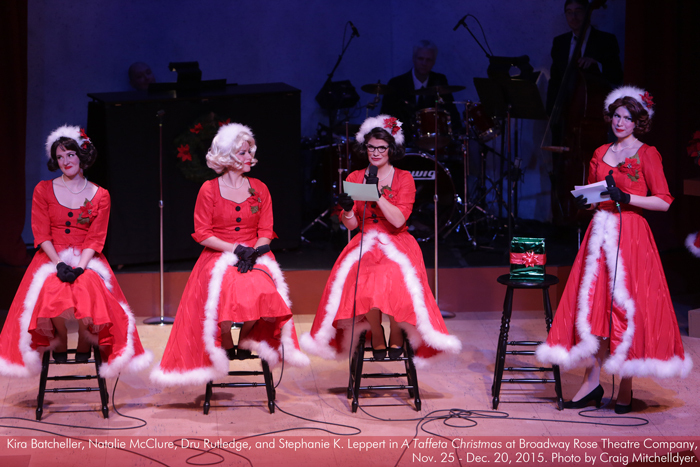 A Taffeta Christmas celebrates the comfort and joy of the holidays. 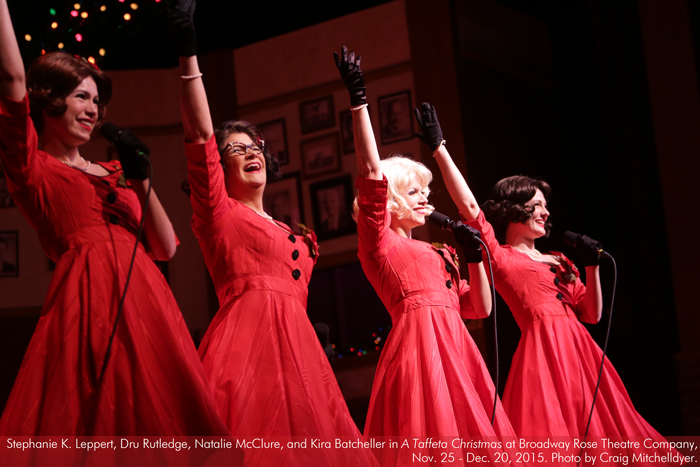 Broadway Rose Theatre Company is honored to partner with Good Neighbor Center to help local families struggling with homelessness, so that they might also experience the warmth of the season while receiving safe emergency housing and supportive, empowering services. 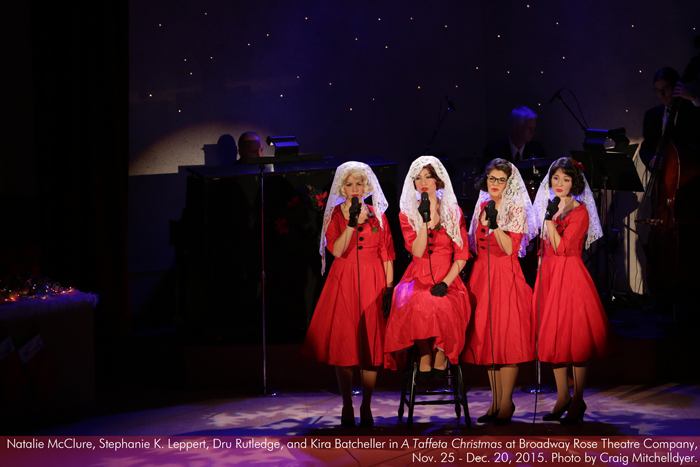 To help our neighbors in need, simply bring your unwrapped gift of any of the following items to any performance of A Taffeta Christmas or to the box office during business hours. There will be collection bins in the lobby. Thank you!